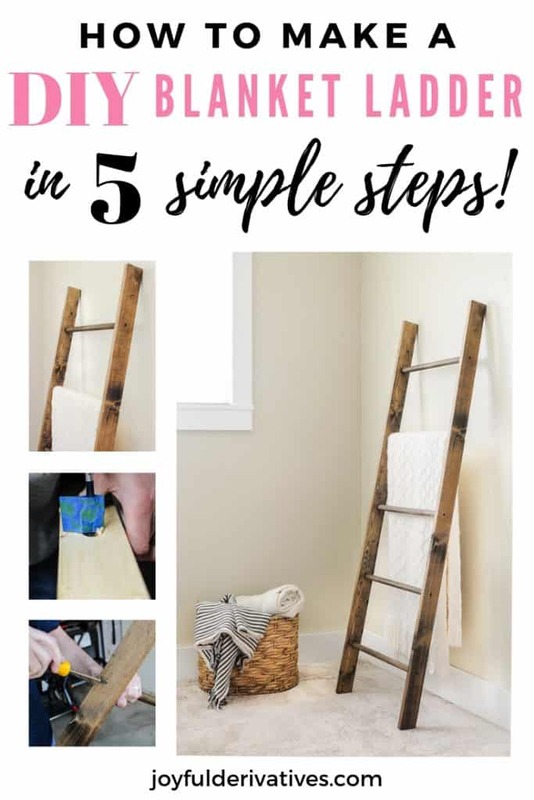 These simple, step-by-step instructions will teach you how to make a blanket ladder that looks just like the rustic blanket ladder from Pottery Barn for just a fraction of the cost! 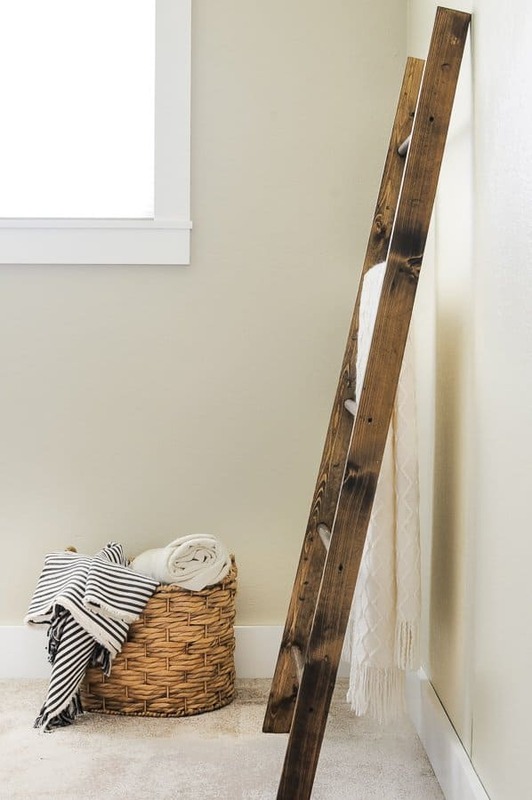 This stunning DIY blanket ladder will not only give you storage for your blankets but it will also add major style to your home! As my husband would tell you, it’s not uncommon for us to have 4-6 throw blankets on our sofa at any given time. There are also throw blankets on our front window seat, our chair in the entryway, and all three of our family’s beds. I can’t help it! I ALWAYS cover up with a blanket whenever I sit down and I hate the thought of anyone having to relax without one. All this to say, when I was invited to participate in a DIY organizing challenge with 10 other fabulous DIY bloggers this week, I knew I had to make something to help organize and store all our blankets. I hope you have fun with this DIY project! 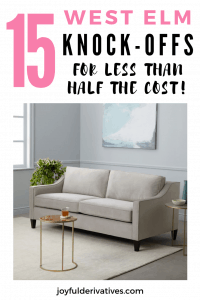 Be sure to check out the other DIY organization projects from each of the bloggers in the challenge linked up at the bottom of this post too! Before we jump into the tutorial, let’s talk about blanket ladders for a minute first. 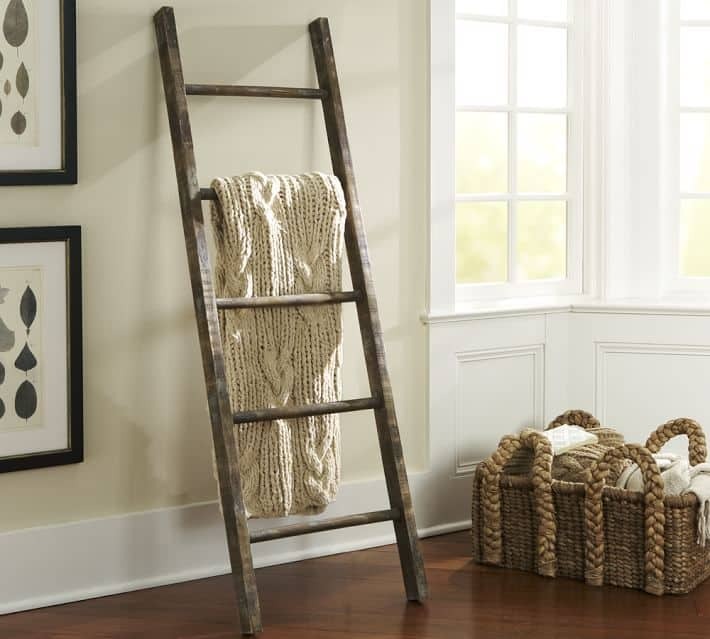 Blanket ladders have become quite popular and trendy over the last few years along with the fixer-upper and farmhouse style decor fad. 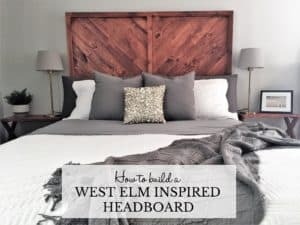 They mimic an old-fashioned ladder but are built and designed to be leaned against your wall and have blankets draped over them. 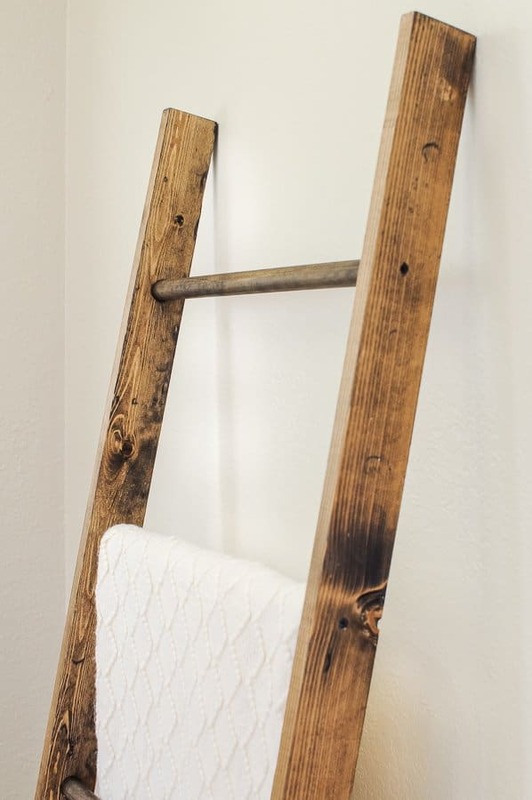 The rustic blanket ladder (like I’m building here) is typically made of wood, distressed a bit and stained. 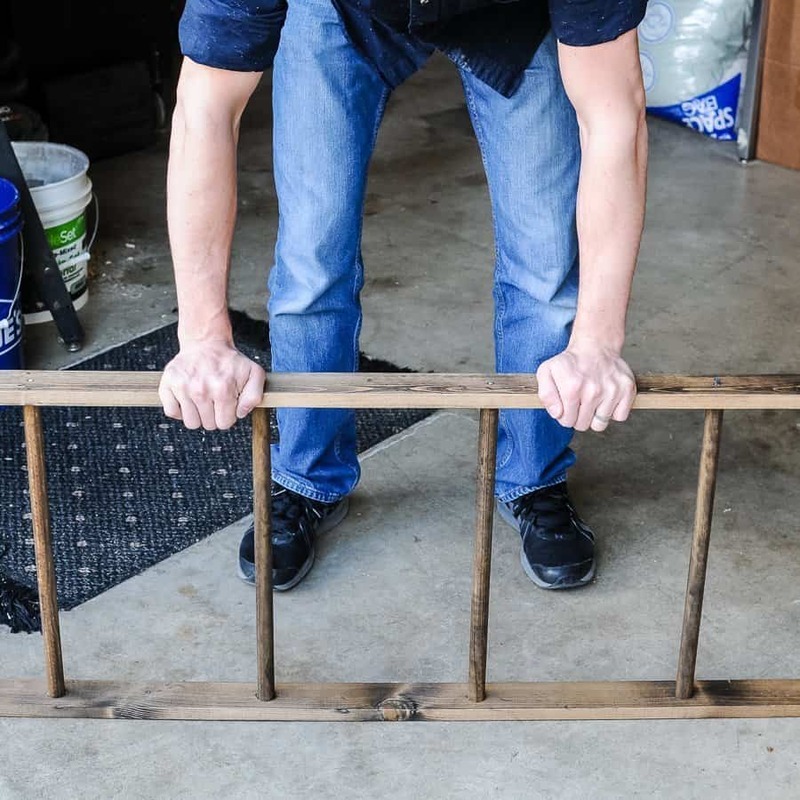 If you’re interested in making more of a modern blanket ladder, simply paint the ladder black instead of staining it or make it out of metal piping rather than wood! 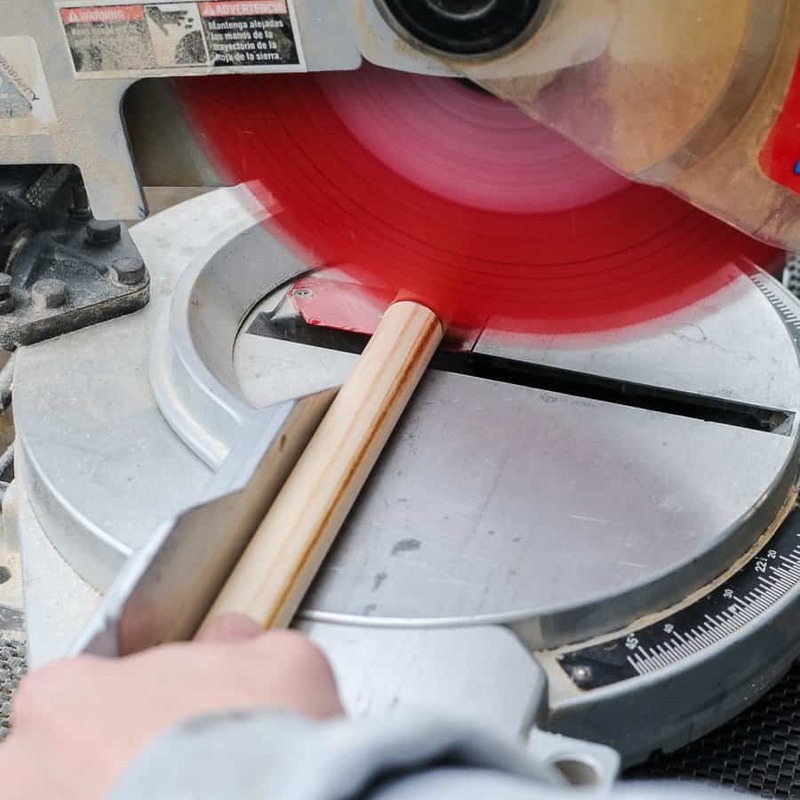 Use your chop saw to cut each of your 1×3 boards to 60″ and your dowels into five 18″ pieces. 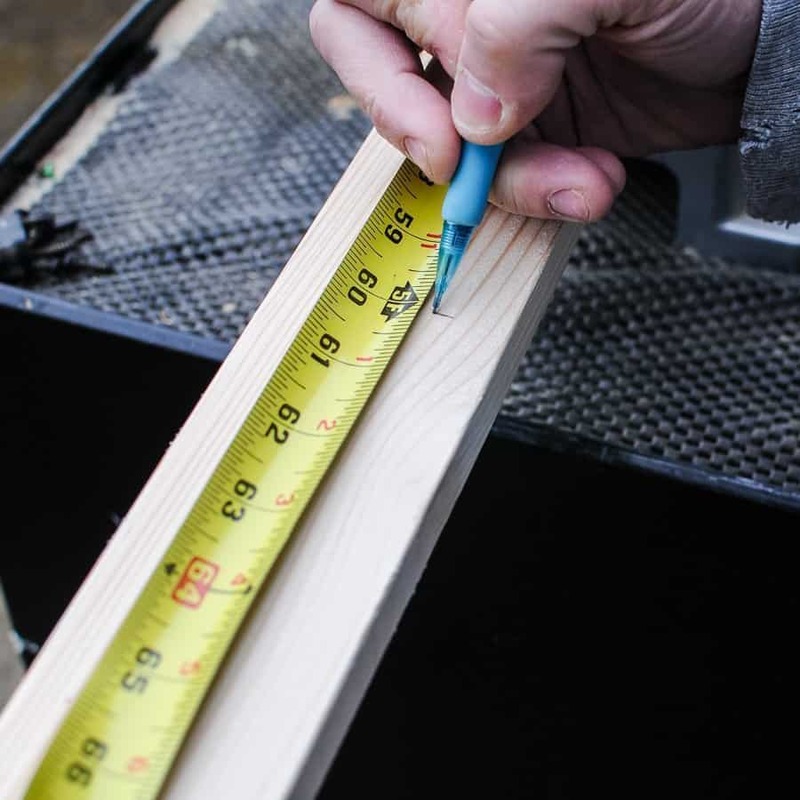 Our final blanket ladder will have the dowels inset into the boards with counter-sunk screws on the outside holding them in place. so, we need to drill the insets for the rungs and the counter-sink holes for the screws. 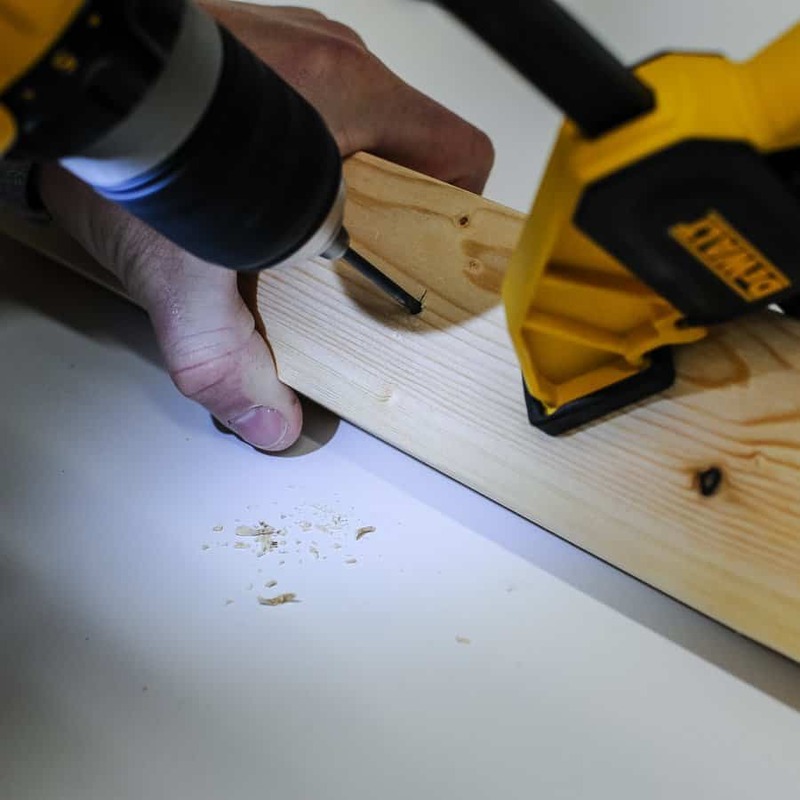 Then, use your drill with your standard 1/8″ drill bit to drill all the way through each 1×3 at each spot. You can see in the picture that we actually used our clamps to hold the two boards together and did them at the same time, but our drill hole shifted a bit on the back board so we wouldn’t recommend doing that. Take your time and drill all 5 holes through each board. The next step is to make one side of these holes the insets for the dowels to fit into and create the rungs. 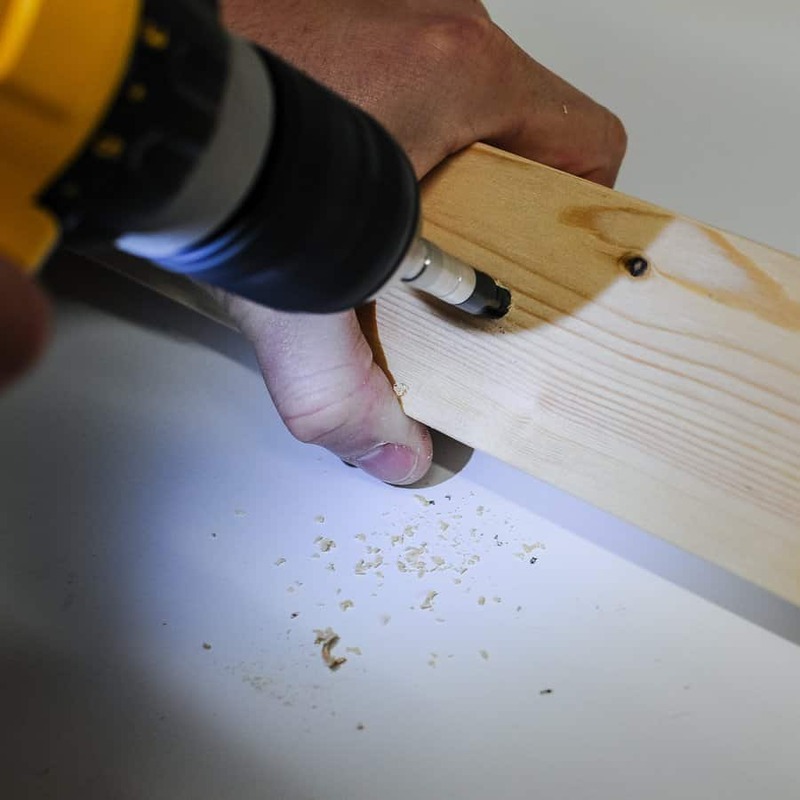 Do this by drilling 1/4″ down with your spade bit at each hole on one side of each board. 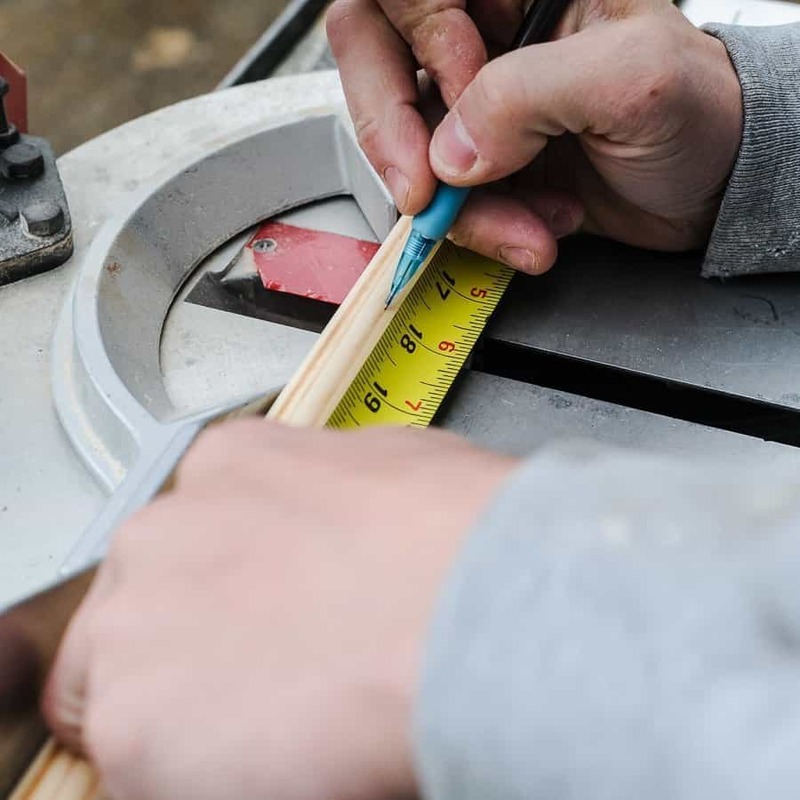 Before you start drilling with your spade bit, a trick we use to know how deep we’re going is to place painter’s tape on the bit at whatever depth we want our inset hole to be. 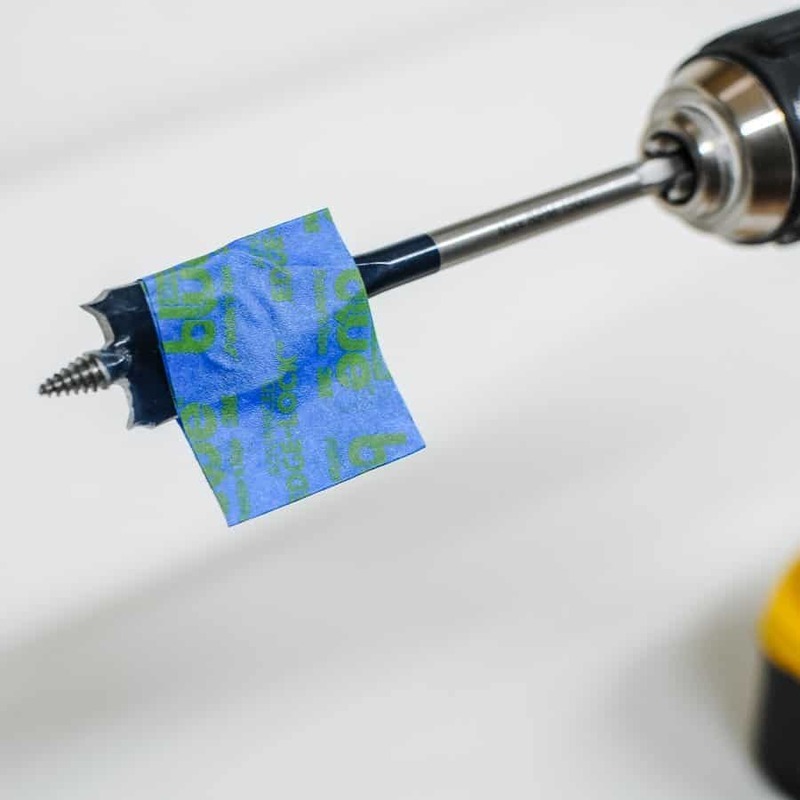 Simply tape a small flag around your spade bit at 1/4″ down and then when it’s drilling you can simply watch for that flag to get down to the face of your board. 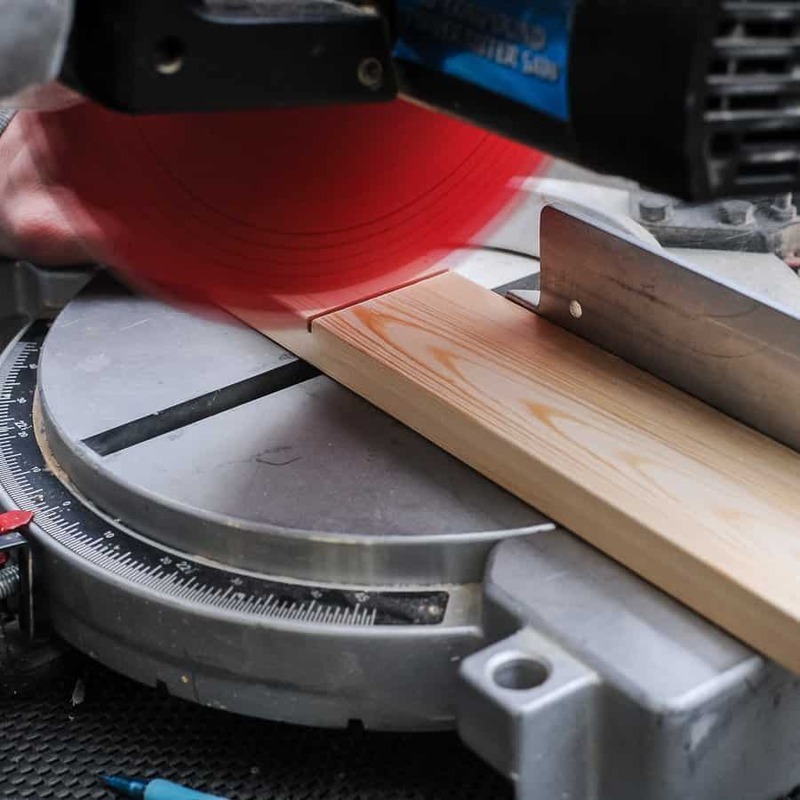 Using your nifty spade bit, drill the five dowel inset holes on one side of each board. 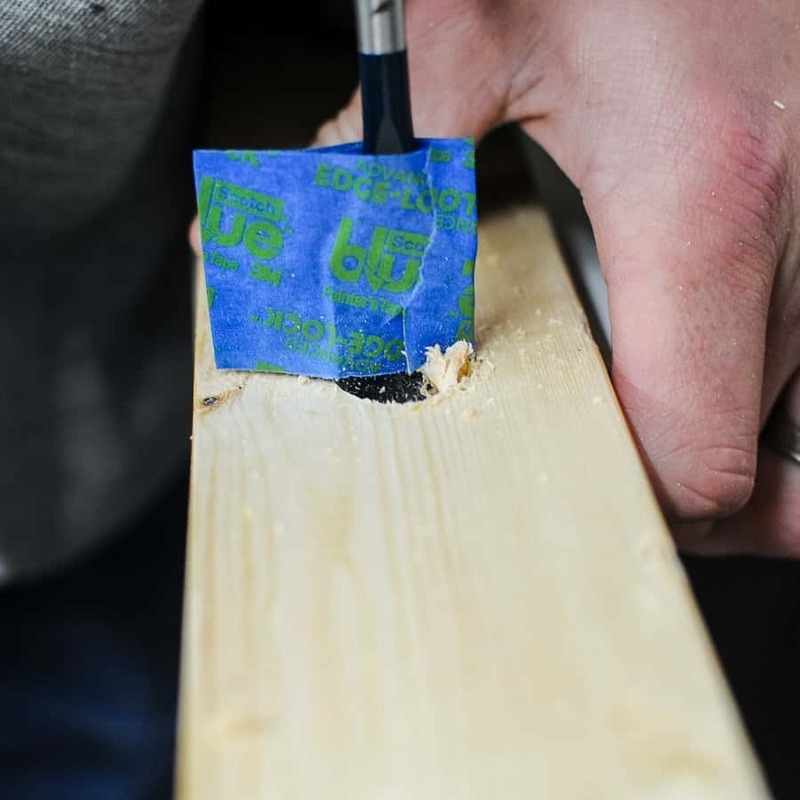 The final drilling step is to use your counter-sinking bit to cut counter-sink holes on the other side of your boards for your screws. 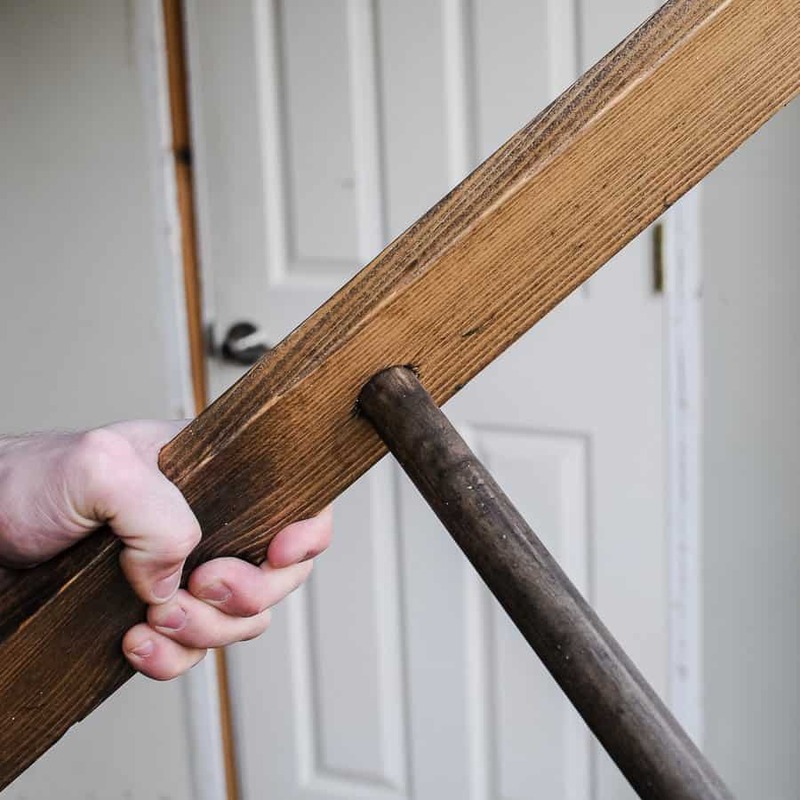 Now that you have your wood all cut and ready to assemble, it’s time to rough up your wood to give it a distressed look. 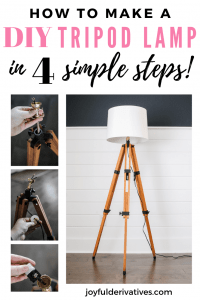 This method will make it a rustic blanket ladder – again, if you’re going for a modern blanket ladder you can skip this step! To distress my boards I placed them on our textured concrete and stepped on them to get some indents then took a small hammer to them for a few larger marks. The next step is to stain all of your boards and dowels. 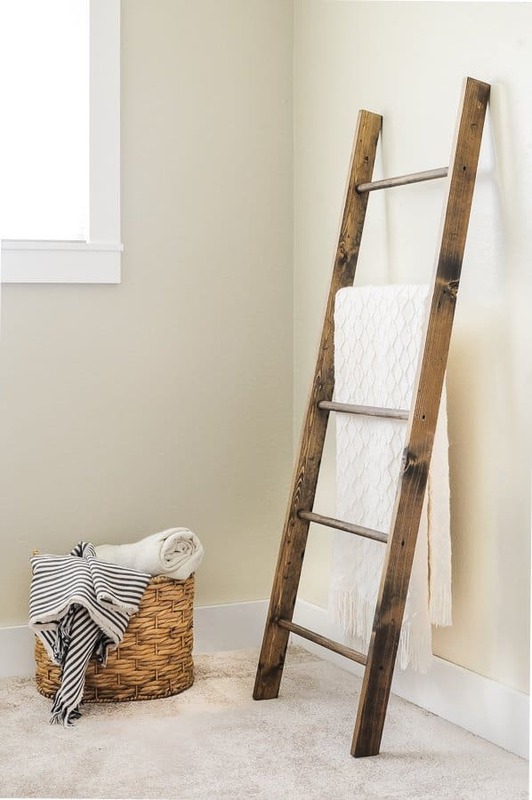 We chose this stain from Minwax, again because we were going for a knock off of the Pottery Barn ladder, but you can choose any stain or paint color that matches your decor and style preferences. 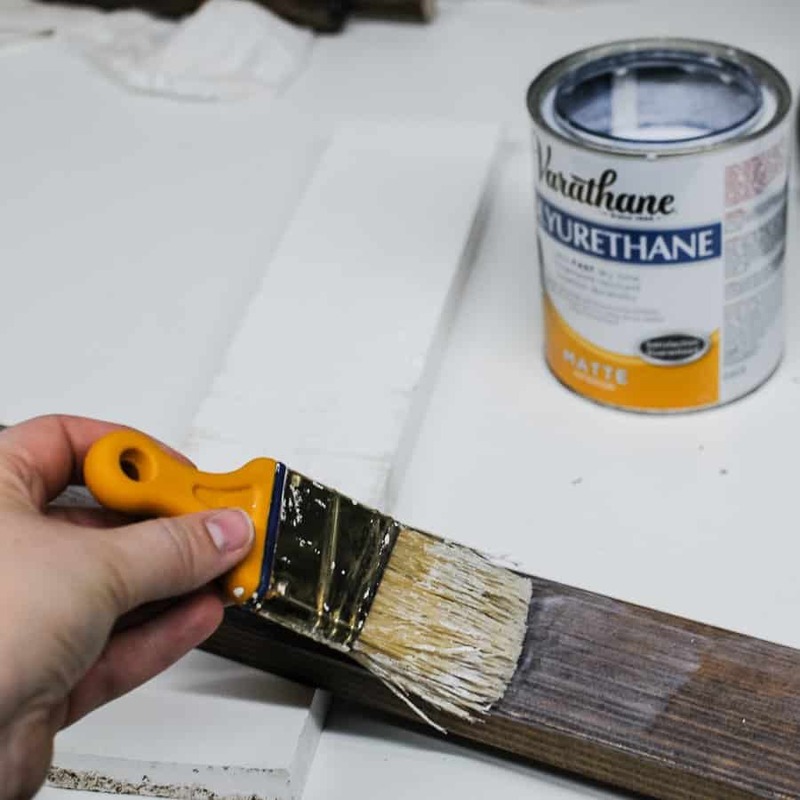 After the stain has dried for 24 hours, use a matte polyurethane to seal the wood. This step isn’t absolutely necessary, but I highly encourage it as a way of keeping the stain from getting on your blankets. 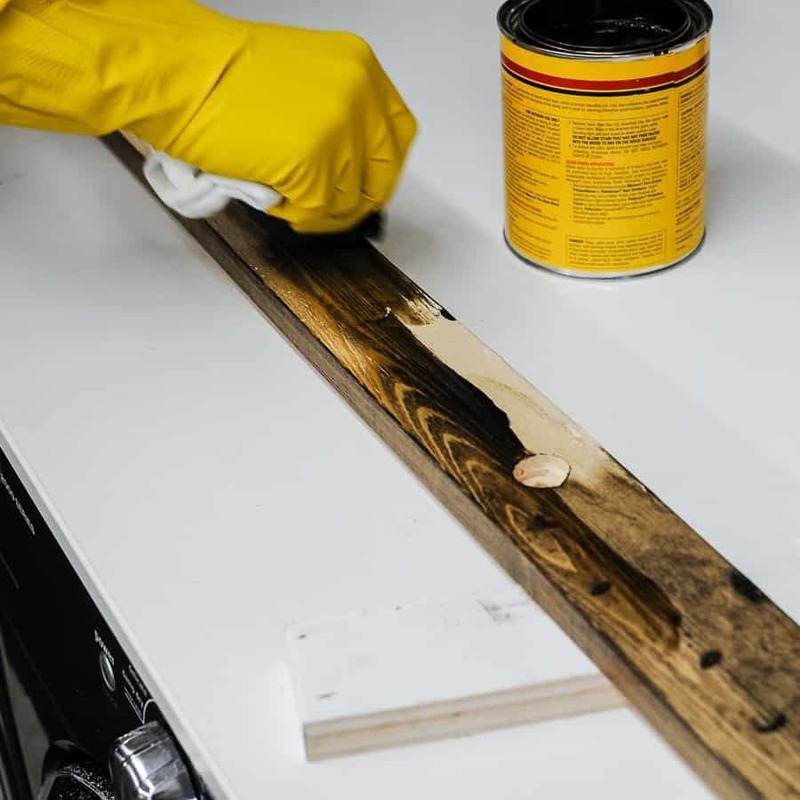 Matte polyurethane is by far my favorite sealer for these types of projects because it allows the wood to keep its natural sheen even after its sealed. Give your sealer 24 hours to dry, and then it’s time to assemble! 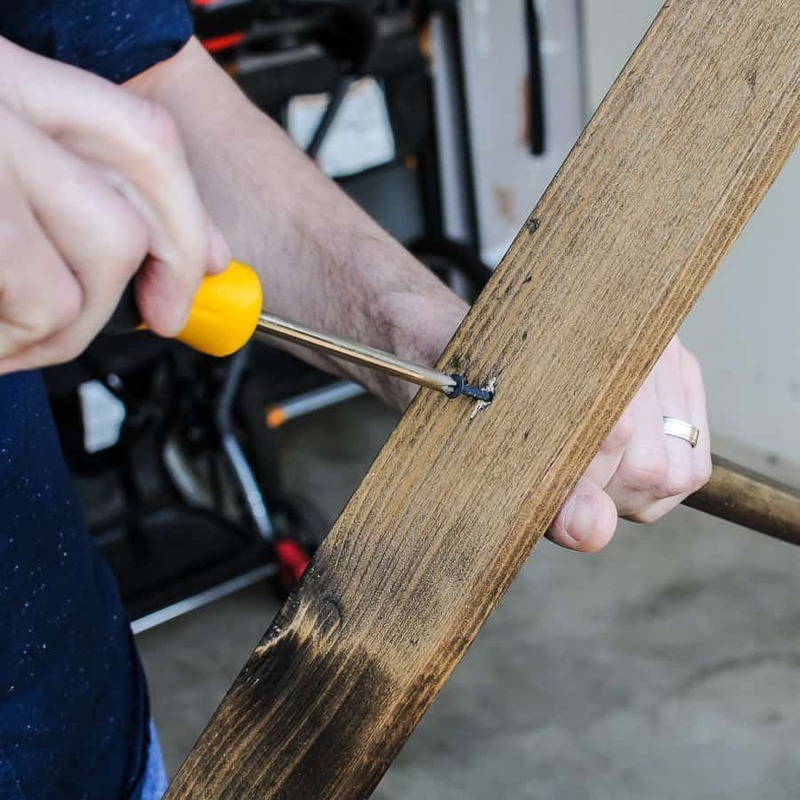 One at a time, push each of your dowels into one of the boards and use a screwdriver to screw them into place from the outside of the board. Once one board is complete, lay it down and press the second board onto the dowels and then screw them all in too. And that’s it! 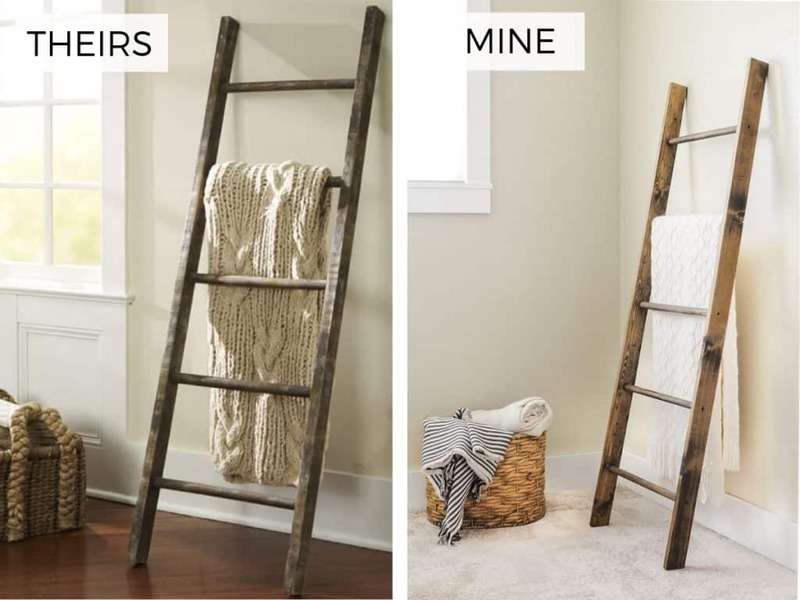 You now have a stunning blanket ladder that looks just like the ones from Pottery Barn for a small fraction of the cost! You could always try adding some decor to it too, like a garland or small hanging sign. I’m always amazed at how easy it is to recreate expensive designer furnishings. I mean, look how similar these look? I hope this blanket ladder DIY tutorial shows you how easy it is to make a DIY ladder for storing and organizing all YOUR blankets! Great job on the look-a-like, but I like yours better! Pinning this idea since I want one too. Yup! I’m making one of these! Such a great in-depth tutorial! I love this blanket ladder! That stain is so pretty! This looks incredible! I’ve been wanting one of these for my living room. Wow, I can’t believe you made this beautiful ladder for only $22! Great and thorough tutorial too, thanks for sharing!! I love how this came out! I liked your blanket ladder better than Pottery Barn’s! It was great doing the challenge with you this month!